I have lived in Corpus Christi, TX seventy plus years and have experienced many hurricanes. Celia (1970) stands out because we had only 24 hrs to prepare. We on the coast must be advised as soon as possible about the potential of a tropical event. I do not expect perfection from the NHC. You are not going to be perfect just provide the best forecast you can and keep the updates coming. I like the spaghetti models as well as the five day forecast model. Keep updating your technical ability you are doing much better this year. Tampa, Florida born and raised and just this year stumbled on your Facebook page. As I have FB open on my work computer it was helpful to not have to look elsewhere for the updates and it was easy to share my concerns with your data to back them up. No one is perfect and Mother Nature has a twisted sense of humor. So, keep up the good work and now that most are appreciative for your educated “guesses” even if I didn’t miss a day of work, lol. I took my family on a vacation to St. George Island the very week that the models were indicating that Erika would hit in that very area! I was glad, to say the least, that we didn’t cancel our plans. I kept checking the NWS, NHC, and Weather Underground tropical updates and determined that with the great amount of uncertainty we were safe to go to St. George Island even with all the media going crazy. You folks did a good job, and it is a difficult one at best. The problem from my standpoint was the hype and over-reaction of certain media outlets. That is going to be more difficult to deal with than forecasting the storms!. I think the NHC did a fine job with the forecast of Erika. If everyone would just carefully read the discussions there would be no complaints. I agree the certain media outlets tend to hype the threat just for the ratings. One suggestion I have is maybe bold texting or color coding some parts of the discussion when there is that much uncertainty, as when the intensity is effecting the track which again effects the intensity for example. Hello, only an amateur meteorologist, but I had some thoughts regarding the Erika forecasts. In certain situations, I feel there are two possible scenarios for the track for a storm– stronger and more northerly (with possible recurvature) and weaker, faster, more southerly. This seems to have been the case with Erika with the big unknowns of how shear and land interaction in the eastern Caribbean would affect the storm. Models were split on the issue, and thusly so was the official forecast. In situations like these, would it not make more sense to actually display two separate forecast tracks/intensities and provide the estimated odds, as opposed to a weighted split of the difference. Isn’t it more likely that one “camp” of models will verify as opposed to being a blend of them all? I realize that this more complicated format could potentially be more confusing, but I think it provides a more accurate picture of the current understanding of a storm and its associated uncertainties. Anyway, just my two cents; I really enjoy and appreciate all the work of the NHC/SPC/NOAA, etc. Q: What’s the only thing a hurricane never does? A: What we think it will do five days from now. To echo: As a central FL resident, I feel that the NHC did an awesome job. As others have noted, the forcast discussion, in this case tells MUCH MORE than the graphic. Bold red letters saying “”Read this”” might be appropriate. (not funny!) Gettting ready for a (possible) severe weather event having an 80 year old man, two 14 month old children and a wife to think about makes all the possibilities very real. Easy to say “much ado over nothing” when it disappated. I’d rather be prepared. Keep up the excellent work. Thoughtful review and analysis. I think being a little too tough on yourselves. No one expects, or at least should not expect perfection. As a meteorologist who worked in tv for 12 years I most appreciated the constructive criticism to media outlets. I’ve been there when a news director says, ‘lead with the track in all weather hits in all shows, hype it up’ after you’ve explained the storm won’t be a big deal or is dying. I appreciate your idea for education, but experience tells me it will never trump the desire to get eyeballs on the screen…which leads to ratings which leads to increased ad revenue. Hard cycle to break. But, again, thanks for breaking down the forecast history of ‘Erika’. It seems to me that criticism for inaccuracy for this storm is unjustified. However, I think your lesson worth learning is that it is probably worth the effort for the NHC to better educate the media on what your products mean. I think your “key messages” idea is excellent. When they cover the tropics here it is hit or miss whether the local weather people pick up that the probabilities aren’t on eventual development of the storm but are on the 2 and 5 day probabilities for development. As a moderator for a hurricane chat/information site, I will say the majority of folks who ‘live’ on the site promote being ready, no matter what, and that we CONSTANTLY promote the idea of ‘this is where this system is at present and the Official Track is a compilation of computer models and human guestimation’. In my personal opinion, I’m very thankful that the NHC exists. It provides incredible information to those willing to read/study/understand what’s being said. As Pappy stated above, Mother does as she pleases (more or less Pappy.. lol). Continue to progress with your abilities, and with presenting information to the public to help keep us safe. Your original cone of error was not that far off at the 5 day plot position and was real good. My only complaint was when Erika was passing through the Leeward Islands you insisted on a track north of Puerto Rico when it would have had to practically turn N.W in order to pass north or there. I think hints on Twitter about changes you guys are seeing with a system between advisories would really help and I really like this blog explaining what happened, keep them coming and keep up the good work. Terrific post. My additional .02 is that I think non-meteorologists are “scared” of the discussion, when as others have mentioned, it’s probably the best TC product. This may be influenced by the highly technical nature of the NWS local forecast discussions. Adding some of the “tidbits” (notably, Stacy Stewart’s!) to the public advisory that make the discussion so great would enhance the latter product greatly. 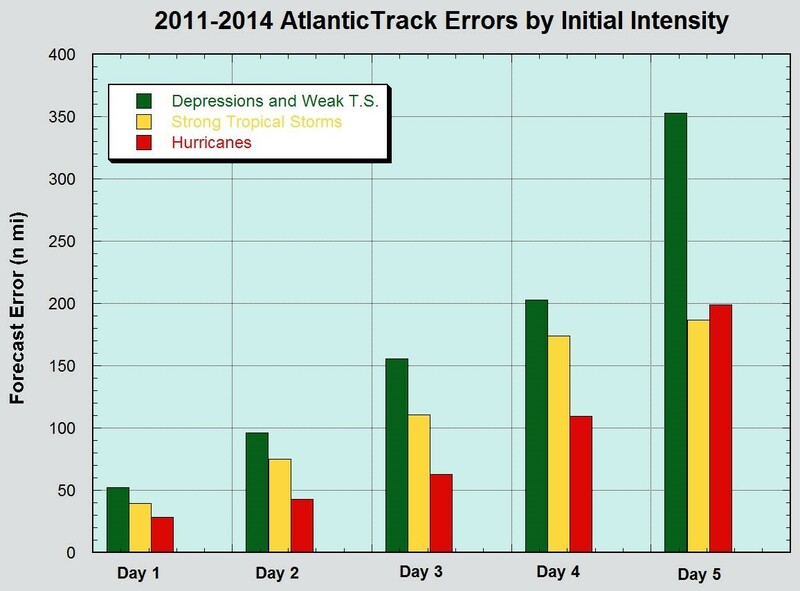 Excellent analysis and we all should strongly appreciate the work at the NHC and NOAA. It was a frustrating system since we couldn’t be confident at all, and the fact that the long range forecast showed a hurricane near Florida alarmed so many people, when in reality, so many scenarios were possible and none of the scenarios were more than about 25% likely (with dissipation always a distinct possibility through the entire lifespan of Erika). I think it was an excellent decision on August 27-28 to withhold the Tropical Storm Watch/Warning for Florida despite falling within the 48 hour window. We need to appreciate the Tropical Cyclone Discussion a lot more and hear what the meteorologist on duty is saying. His or her own words are much more valuable than the basic information spread in the current forecast and on the forecast map. Having alternate possibilities, in cases such as Erika, might be valuable as well. I tried in my own predictions (I am an aspiring meteorologist hoping to enter that training in a few months) to show percentage possibilities, although the forecasts I drew certainly had its fair share of criticism as well. I feel you forecasters at the NHC did what you could with Erika, which in my opinion, is still a very good job. As James stated, and various things I took away from talking with you forecasters at the 2010 National Hurricane Conference, IT IS extremely difficult to get too much closer than you at the NHC did. The system was for the most part of her life, weak, and not to mention, tilted most of the time instead of being vertically stacked. This most definitely poses a problem or the global models in latching onto a “good” LLC. I still say KUDOS to all of you! Fantastic post Mr. Franklin. I’m not a meteorologist, but a self-taught weather geek. By training, I am a biologist, so I have enough scientific expertise to understand the technical aspects of the forecast discussion. As a long-time resident of the Texas Coastal Bend, I have, for years, used the Tropical Storm Force Wind Probabilities information to help me decide if and when to evacuate. Although I don’t spend much time watching local TV weather, since I have the internet, I don’t recall ever hearing local on-camera meteorologists refer to the wind probabilities forecast. Another issue that really bothers me, is the propensity of some on-camera personalities to sensationalize any severe weather event. Also, thank you for pointing-out the UCAR training module for the Wind Speed Probabilities forecast. NHC has always done a fair job in tracking these storms. I am from St.Maarten and we were truly blessed to not get the rain that was expected (Dominica did not fair to well) Its better to be storm ready then not at all. Wind was pretty strong on my end as I live on the beach. Thank you NHC. Echoing a post anonymous made, but I think for all the good the NHC forecasters do and have done and will do, there’s a case to be made for changing how forecast products are delivered — and in some cases, maybe not issuing them every package. Also, if the discussion refers to a low confidence in the predicted strength/direction of the storm, it should be included in the forecast. It’d be great if everyone read the discussion, but as a whole, people go straight to the public advisory because that’s the Word of God, whereas the discussion is more of an analysis meant to suppliment the public advisory (in fact, wasn’t the discussion not explicity meant for the public at first, and wasn’t there a warning on the NHC site about non-meterologists using it to interpret the forecast in the early days?). Maybe something like “Erika is expected to strengthen over the next 48 hours; however, if the storm continues moving to the west, it may be disrupted by land interaction with Puerto Rico and the Dominican Republic,” or “Erika is forecast to turn to the west-northwest over the next 24 hours; however, an alternate possibility is that Erika maintains a due west motion.” You don’t want to undercut the forecast, but if there’s low confidence, it should be reflected in the public advisory. People don’t like hedged bets, but with a proper explanation, they’d still find it useful, and it covers you in the case of a Erika or similar storm. Of course, there’s only so much you can do (2007’s Humberto), but at least it provides a little more wiggle room. People complained? The coffee shop must have been out of their favorite latte. I don’t think it had anything to do with NHC’s efforts or performance. Haters gonna hate. Meanwhile, keep up the good work. We made a point of mentioning in every presentation the possibility of it falling apart. As usual NHC does an excellent job. Its too bad that with so many voices and apps just showing a cone… folks may not hear the explanation and this may lead to confusion. Keep up the good work. Again, great article and since my 1st experince with the tropics in the 70s every utterance from NOAA is digested and I make my own decisions for preparations. I use to rely on High Seas Radio back then for advisories & have maps at hand with parallel rule etc. Today it is a breeze & and i am so grateful to the crews that produce all this great information. I was able to see Ike barrel over Grand Turk on my Blackberry untill he finally took out the phone service. There were no deaths & few injuries as we were ready. Thanks NOAA & associates. Like so many others is the past, this storm never presented an opportunity for the forecast confidence to rise above decidedly skeptical. Kind of makes me wonder if the first line item for the (text) public advisory Summary of Information and the (graphic) cone Current Information should be “Confidence:”. I applaud this review; that said, I’m a former USAF Weather Forecaster and currently in college to become a math & science teacher. My number one criticism with this system is not the technology, not the models, but the forecasters and meteorologist writing the discussions. I have a problem with discussions that do not represent the current state of the cyclone. Yes, we’re all in the forecasting business, and one can argue we’re in the “now-casting” business too. It’s easy to point a finger at the technology and say, it’s to blame; nope, human being are and always will be and that is a reality and a responsibility all involved in the decision making have to accept. I would encourage all of you to re-read the discussions to include AFDs with this system and ask yourselves how well was our profession served when you pick the information within them apart. Start with that insistent 280 degree vector that too often was not. There were moments the discussions were spot on, other times completely oblivious to the current state of the cyclone. I know we have a hard job and I’m equally proud of all of us in this profession, but there too is this thing called common sense and ever since Sandy, I remind myself there are no points for continuity and persistence, but when I penned my name to the bottom of a 175-1; I accepted it is my responsibility the moment the pilot walked away from my briefing. When mets and forecasters blow it at NHC, who do they answer to? Good post and discussion about a hard system to forecast. Thank you for soliciting comments. First of all, you can’t change the media’s penchant for sensationalism. It gets eyeballs and makes money. Second, you have made it clear from your graphs here that the cone is not an accurate depiction of the actual uncertainty of the forecast. The cone should be tighter for stronger systems that can be forecast with better accuracy and broader for weak systems that are hard to predict. Moreover, your discussion raises questions about the measures of “probability” of landfall. To be accurate, the probability distribution should be broader with a lower peak amplitude for weak systems than it is for strong systems. One of the most confusing issues with NHC and NWS forecasts is probability. A better delineation needs to be made between inherent random variability and the uncertainty involved in a specific weather situation needs to be made. 50% chance of summer air mass thundershowers is not the same as 50% chance of winter rain because of the stochastic distribution of thundershowers is very different from the uncertainty of a winter rain forecast. Likewise the cone of uncertainty of a hurricane is not the same as the cone of uncertainty of a weak sheared tropical storm because different uncertainties are involved. FYI I am a geochemist who blogs about environmental issues. I went to weather map discussions at lunch hour at UCLA when Kerry Emanuel was a newly hired professor. His genius did not rub off on me but I have closely followed his papers on hurricanes over the years. Occasionally I blog about hurricanes. I live blogged Sandy and Typhoon Haiyan. I appreciate all the excellent information the NHC puts on line. Kudos to NHC for all the work you do! Public media should be ashamed of their coverage. They (ABC News) tied mudslides in Dominica as the storm was passing there, to Florida needing to be concerned immediately in a way that made the threat feel immediate, and severe. This was not appropriate at the time and made seniors overreact. Last time I visited S. Florida I did not see any mountains or hills and this rain related issue had no place in the context of Florida, for what has not an established threat to there at the time. Media should consider less dramatic ways to raise concerns with a public that does not understand probabilities very well. Interesting article but very US focused. I think it would have been worthwhile mentioning the impact on Dominica and the reasons why no warning was posted for this island. I appreciate it was outside the ‘cone’ for most of the forecast period and the impacts were caused by rain not wind. However, not a dissimilar situation to Sandy, whereby severe impacts were felt outside of official watch or warning areas, but due to the rules governing how and why warnings are issued, residents were not subject to an official tropical storm or hurricane watch or warning. This meant that areas where there were lives lost were not subject to any official warning so residents were less well prepared then they might have been under an official warning. I understand some of the rules were altered in light of Sandy. It would be worth some discussion around whether the impact on Dominica could have been better predicted and whether more alerts or warning could have been given to residents there. Soy meteorologo del Instituto de Meterologia en cuba y recuerdo cuando la tormenta cruzaba las Antillas Menores, un familiar en Miami me informaba que muchas personas compraban desesperadamente alimentos y otros utensilios en las tiendas, al ver el cono del CNH indicando la posible llegada de Erika como huracan a ese punto. Me decia que era una exageracion, realmente, le conteste, ya que era dificil en este caso saber con anterioridad que trayectoria e intensidad podria tomar este sistema. Creo que casos como estos, un sistema debil y con una continua trayectoria mas hacia el oeste de lo pronosticado, las previsiones mas alla de tres dias no pueden ser confiables. Estoy de acuerdo en que las personas deben conocer mas sobre la incertidumbre en los pronosticos de ciclones tropicales y la dificil tarea de pronosticarlos. Gracias. I echo some others above in believing you folks did a great job. I travel between Florida and DC, with homes and businesses in both locations. We happened to be in north Florida at the time and I paid close attention to your site, in particular, the TCDs. We were able to remain in FL due to your discussions. I’m not a meteorologist, but don’t find them above my head. If only you can get the media to pay attention to them! I think you did a fine job…..but I read all your discussions at the end of each of your forecasts. They clearly stated that the projections were impossible to accurately state. Come on folks….this is nature, we’ll never totally be able to perfectly predict what will happen. I live on my boat, in Florida. All of this was VERY important to me. Thanks to all of you for keeping us informed. thanks to those people with the courage to fly into these storms. I am certainly not a meteorologist but I live in Florida and own a boat so reading everything in storm season is part of my DNA. I don’t think the scientists did much wrong analysing Erika. Not perfect but nature will never allow that. And the NHC is invaluable. Without them many, many more people would die or be injured. Hats off to those serious folks. Media management, however, is terribly biased and it is unconsciable what they do: “Let’s be sure all our viewers are sure Erika will effect them (and our ratings will go off the page!) 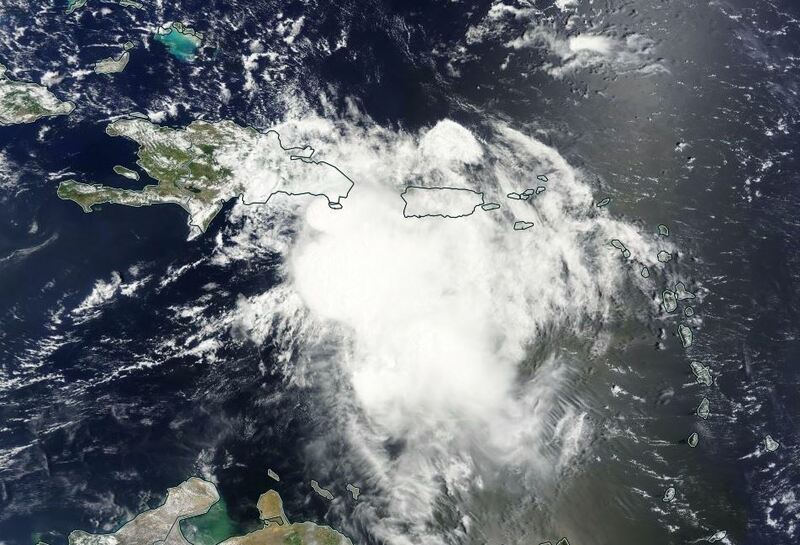 Hence, nearly every discussion and forecast was “…Erika will turn north any minute now!” despite more than 5 days of her almost due west track and sights firmly aimed at Hispaniola, the USA’s biggest friend when it comes to taking the punch out of tropical storms. Sadly, perhaps the real scientists become influenced by this bias too, not wanting to be ‘on the outside looking in’ if the storm counter-intuitively does go north and millions are effected by it. Dominica was severely hit by TS ericka but no warning or watch was given for Dominica at no time. As a matter of fact this island was never mentioned. Was the margin of error that wide ? Perhaps the NHC should add a section to the forecast called “Media and Government Statements” It would be Ok if it was a copy of the discussion…. So many times the media has made changes to the forecast wording and changed the forecast. I have been following hurricanes since Audrey hit us in Texas in ’57. You guys do a good job. Don’t let the media’s perpetual motivation to find/make a news story detract from your core mission. Your ability to predict the behavior of an incredibly complex phenomenon, though imperfect, increases constantly. I have the utmost respect for your work. Do away with the 5-day forecast and go back to the 3-day forecast. Your error is too large for any tropical system for a 5-day forecast. The 5-day is over 200 nm error, just don’t make any sense, and it just creates more hype in the media. I live on the Jersey Shore and these things are extremely hard to predict. In 2011 when Irene hit, though it made landfall very close to my hometown, it was hardly a threat. We had several day notice, but it never panned out like they thought it would. In 2012 when Sandy hit, the Euro model knew what would happen. However only 2 other models synced up with the Euro model. These things are extremely hard to figure out and you can never be too prepared. Remember things can always be used or returned but you cant prepare once the storm is already there. This is a very good retrospective review of TS Erika, thank you for this. This is what good science does and what is needed and well worth the effort. 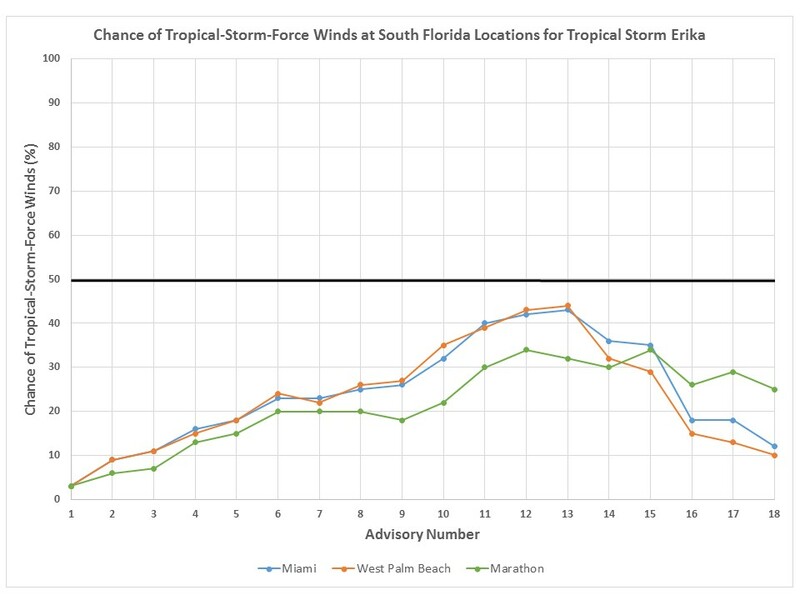 After reviewing forecasting since the 10960’s I have found that the ability of the NWS to provide reasonable forecasts for very complicated situations to steadily improve, despite the situation regarding Erika. The upper level wind shear this year is quite amazing as system after system seems to evaporate overnight. I was surprised that Erika faded as she did, however the beauty of all this is we have systems in place that capture the events and learn from them. What worries me more is – the models continue to improve, and the models continue to tell us that the future has a continually warming planet. This is something that can not be ignored – thank you for your service. The introspective review is beneficial. Excellent review of the behind-the-scenes activity. To echo everyone’s comment here, NHC did an excellent job. Looking at the graphs one realizes how much the forecasts and actual occurrence have begun to converge, compared to only two decades ago. Great work! NHC did a very good job. I cannot remember a Tropical Cyclone Discussion series from an earlier tropical cyclone in which you consistently reported that your confidence in the forecast was low. What more can you say? I will remark that the Discussions are sometimes long, as they certainly need to be for completeness. However, I have taught meteorology to laypersons for 20+ years. And when interest in the details of a topic is low, like a syllabus for example, students skim or do not read material carefully. Perhaps with deadline pressures, the media does the same, especially those whose interest and knowledge of tropical cyclones is small. They look for the bottom line and ignore, or do not read, the caveats. at some point when the models were expecting a right turn and Erika was not making that turn. at that point the forecasters should have ditched the models and gone back to manual analysis . hand drown/ light table – the whole thing. well o.k. to a modified extent. when something is not working ( anything ) you go back to basics. A great article and a good job on the storm. I think many of us forget how unpredictable nature can be. I agree that the Tropical Cyclone Discussion is an underutilized, but critical, tool in understanding the nuances of any forecast. Anyone charged with public safety and/or risk communication is remiss if they ignore the TCD. I like the idea of using the cone to display forecast uncertainty, but do not think changing the size is the right approach. Cone size has specific meaning and changing the sizes for each event would be very confusing. However, using different shading, fill effects or even line colors to depict uncertainty could be useful and easy to communicate. That weak and disorganised has set Dominica back an estimated 20 years, and probably 50 people died (numbers seem still uncertain). The forecast shows it OUTSIDE even the 0-5% wind probability chart. Maybe those of you in the US can breathe a sigh of relief and wring your hands over the ‘poor forecast’. But please don’t ignore the 70,000 plus Dominicians who have suffered. IF you had bothered to go back in the Storm Archive, you would have noticed that, 48 hours out, the NHC was predicting some areas on that island getting a foot of rain…so I don’t quite see how any forecast was blown. Further, max sustained winds on Dominica topped out in the high 40’s…barely TS strength. Sure, 50 knot gusts are substantial, but nothing that anyone is going to mistake for a hurricane. Finally, just because those folks in Dominica did NOT heed the warnings of their government is not the NHC’s fault…this blog post was to discuss the science of forecasting, NOT a place to screed socio-economic rants. I believe the NHC should put more resources on improving the 72-hr forecast model instead of pursuing an ambitious 120-hr forecast. 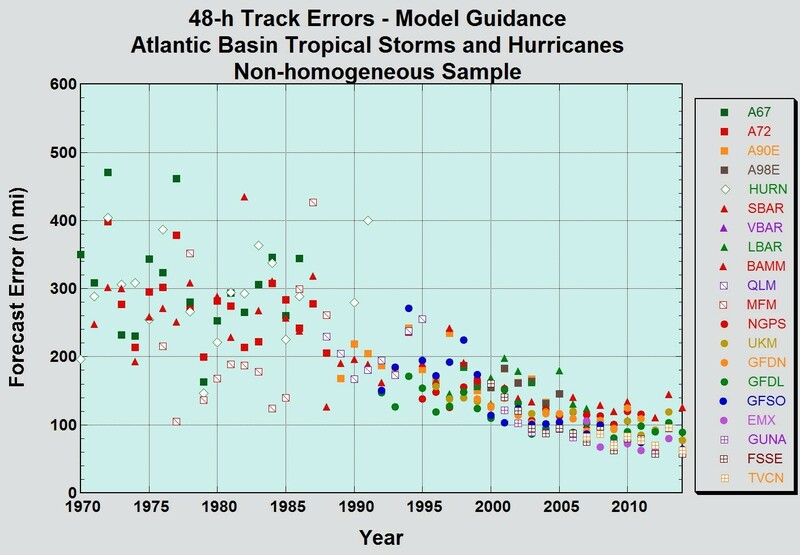 After studying the graphs provided in this article, is clear that the 120-hr forecast track error by initial intensity is more than double compared to the 72-hr forecast track error by initial intensity. 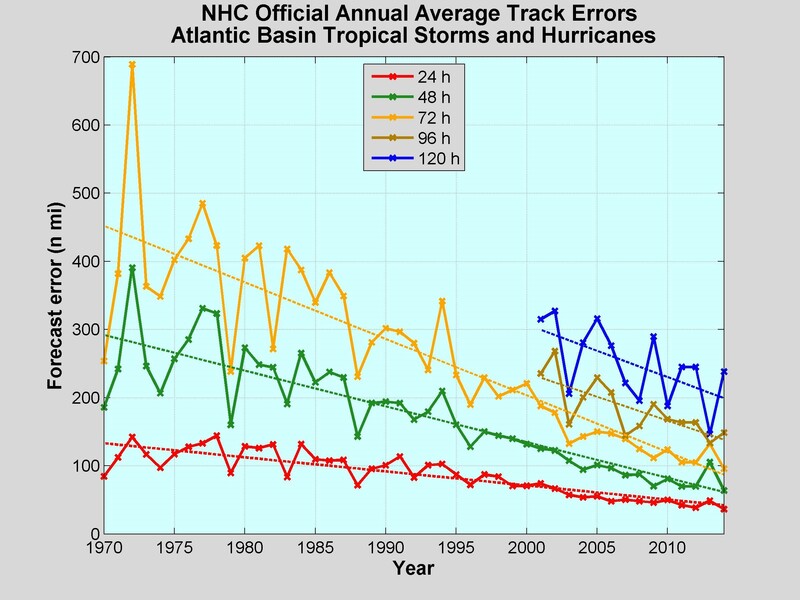 At the same time, the annual forecast error by 120-hrs have increased while the 72-hrs forecast have improved. Having said that, clearly the 120-hrs forecast is not trustworthy. In my opinion, NHC should use the limited forecasting engine resources to improve the 72-hr forecast model and discontinue the 120-hrs forecast product until the model reach the current 72-hr forecast error margin. Second, I would recomend that the NHC include a “Confidence Level” in the weather forecast. If there is something hard to explain is a “gut feeling”, particulary among experts and professionals of any field. I’m sure the meteorologysts working on these forecasts must face the data and present their findings based on empirical evidence even if they have the feeling that the information available may not reflect what they feel is going to happen or what they see with their own eyes. I believe that by having some sort of forecast Confidence Level or Index Level or what ever they could figure out may fill that gap between how a meteorologyst feel about a forecast based on their experience or what they see that numbers or data can’t tell. At the same time, the media will have an additional tool to level the tone of the message that they will attempt to send. I’m from Puerto Rico and every year we have to deal with the media circus and serious weather systems threatening the islands. This was very well written. Maybe a simple solution to better indicate the intensity forecast would be to add a range of predicted winds in parentheses next to the date/time text on the Warnings/Cone Static Image. As uncertainty increases, the range would increase. And it would be helpful to have wind values shown on the map rather than just the D, S and H and M letters. There are a lot of people who do not have a meteorology degree but are very interested in weather. Having said that, the information that is provided gives us a picture of what to expect. The cones, 24/48/72 hour predictions of wind/location are extremely helpful. Any idiot who did not prepare would have been moaning if Mother Nature decided to change her mind and ramp the storm up. My suggestion would be to order the graphics in line with what people click on. Use a counter to see what draws the most interest and then line them up that way. I tend to use 3 or 4 of the graphics to give me an idea of what to expect. The discussion page is the most useful because it allows us to see what is going thru the mind of the forecaster. I saw several points there that made me think it would be a bust and it did turn out that way. Having working in media I can attest to a problem that is going to only get worse. TV in particular want ratings, not to get the correct info out to people. With mandates to provide info having eroded over the years there is no reason to get just the facts out…they have to outdo the other stations in the market to get viewers. I agree that training the on air staffs would be very helpful and maybe if AMS takes it seriously they will make it a mandate to attend some workshops to keep their seal of approval! Thank you for all the great work over the past 10 years and please do not let a miss stop that from going forward. You guys are fantastic. It is a testament to your commitment that you will seek your own mistakes and ways to improve regardless of accuracy or inaccuracy of a given storm. I have no meteorological background, and frankly, don’t even pay much attention or have a great deal of interest in the weather. But I have lived my whole life in Florida! How could someone living here, at a minimum, NOT not understand your forecasts or NOT read the discussion? I got hooked on reading them regularly (and not just when personally in the path) during the terrible year of 2005. They are well-written, professional, and entirely understandable; I think I have even detected some dry humor in them occasionally, which is most welcome. Keep doing what you do – and I can make the rant you (quite properly) cannot: how about instead of whining about other people and other organizations needing to take yet more time trying to overcome people’s laziness and willful ignorance, all those that don’t have time to understand what they are talking about take some frickin responsibility for once? It is the NHC’s job to provide the best, most accurate current data and forecast given current understanding and means. The NHC is a model organization for how “the Government” provides an excellent value and critical services (despite popular belief that everything OUR government does is inefficient and unnecessary). It is NOT their job to pander to media who are supposedly too busy and definitely to profit-driven to bother knowing what they are talking about, nor bother to provide accurate info. Nor is the NHC responsible to somehow reduce an inherently complex issue into the “simple graphic” or “one line/sound bite” type of explanation so many want. Sure, it would be great if everything was so simple you didn’t have to take the time yourself to learn how to consume the information freely provided – but TOUGH; most of life isn’t that simple. Most things worth spending any time on NOT simple and are NOT subjects that can be made idiot or lazy-proof. They can’t and they shouldn’t be. The lack of personal initiative to understand today’s problem’s instead of whining about how nothing is spoon-fed directly to one’s brain goes a long way, IMO to explaining why there is any doubt whatsoever about anthropogenic climate change and numerous other non-linear, “wicked” problems faced by our complicated society. We could go back to masters and slaves and 30 year-life spans … Things are pretty cut and dried at that point … No annoying personal responsibility to wrk at understanding the world you live in at that point. Okay, end of juvenile rant. I still believe it, but can admit it’s less than a mature approach ;-).